Presented to you in this infographic are 16 shocking facts about the environment. The first 13 were highlighted in Julien Wosnitza‘s recently published book “Why everything is going to collapse?” and the last 3 facts were cited on planetoscope.com. The author of the book also presents solutions that are necessary to bring about change. 16 shocking facts that prove that humans are the biggest menace to our planet! This info-graphic is free to be shared. With plankton threatened the food chain is in danger! Ocean acidification as a result of climate change and pollution. 90 % of whales are disappearing, as these giant sea creatures travel the ocean they boost plankton numbers. Fungicides, herbicides, insecticides and other chemicals directly affect phytoplankton and zooplankton. Life on Earth depends in the food chain working correctly. If it starts to malfunction then nothing can work properly. All it takes is for one species to disappear to upset the balance of an ecosystem for good. However, when we know that 55% of the wildlife has disappear in only 40 years, we can start asking ourselves questions about our continued survival in the near future. Plankton is the food base for many marine species while these marine species are a food base for land based species like humans. As a result it could be argued that our survival is linked to the survival of plankton. Plankton and the Amazon rain-forest are the two of the lungs for the planet and are our oxygen engines. However every year, our oceans lose their capacity to absorb 190 million tonnes of carbon which is causing the progressive disappearance of plankton. Julien Wosnitza, the author of “Why everything is going to collapse?”, is 25 years old. Instead of progressing into a banking career after his studies, he left everything to embark on a Sea Shepherd Boat. After having helped to save endangered species in the Cortez Ocean in Mexico, he founded Wings Of the Ocean with Sébastien Fau who was also a Sea Shepherd volunteer. What does the Wings of the Ocean involve? 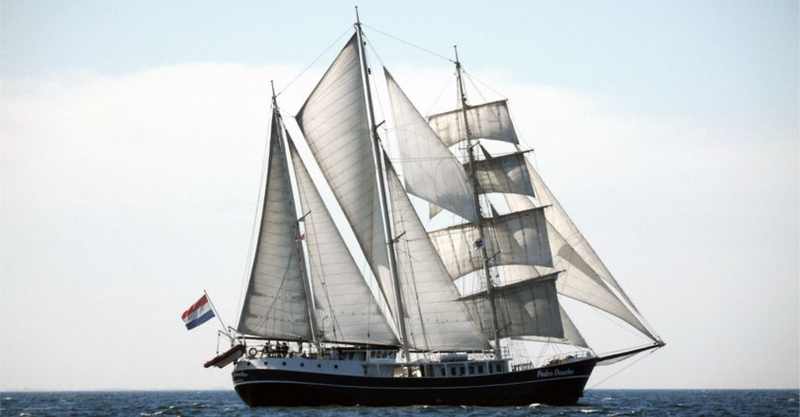 The organisation has a 43 metre long sailing boat called the Kraken which travels the oceans with the aim of clearing pollution from the oceans from plastic waste to fishing lines. However this is not the only goal of the organisation. The boat is also a sailing school to learn sailing skills as well as a way to take scientific studies. The boat’s first mission began on the 3 October 2018. Thanks to the help of volunteers, donors and subscribers we hope the boat can travel as often as possible!